You can roll your foot with a lacrosse ball but two held together like this makes it a lot easier to do the sides and edges. You can put two tennis balls in an old sock to do your vertebrae but this thing doesn't get grubby like a sock and there's some benefit to having them more solidly held together. I'm happy with the purchase. 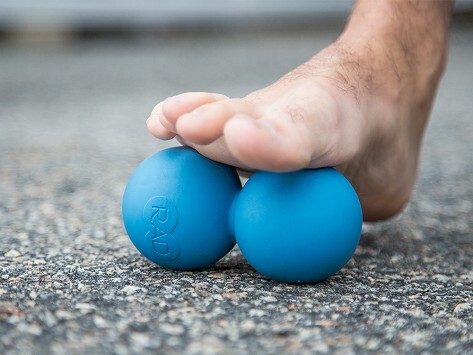 RAD Co-Founders Mike Mallory—a biomechanics expert—and Dan McIntosh—a professional triathlete—redesigned traditional body massage tools to be more effective. Their ergonomic massagers are made to target muscles and soft tissues more easily. By slowly and steadily rolling them over or under different parts of your body, you can help free up movement and even clean out toxins. With several tools to choose from, you can target any spot that needs attention with as much pressure as you like. The Roller is compact enough to take anywhere—it’s two conjoined rubber balls that work best if used on the floor or against a wall. The Helix adds an important indented design to the typical cylindrical roller, maneuvering around the spine and bones more easily. The Rod is a thin, coated roller that promotes myofascial release. You can even pair the Rod with the Helix to reach your entire back like a big, massaging rolling pin.